The Supreme Court on Wed­nes­day ordered that the two men convicted for the 2004 killing of Free Trade Union President Chea Vi­chea be granted bail, and that the Appeal Court reinvestigate the case against the two men. “The Supreme Court orders the temporary release [of Born Sam­nang and Sok Sam Oeun],” Dith Munty, the Supreme Court’s president and chief of the five-judge pan­el, told the courthouse. The announcement of bail was greeted with a mix of applause, ex­citement and relief by relatives and friends of the two men who had ga­thered at the courthouse. Arguably the most controversial criminal case in the country’s re­cent history, the details surrounding Chea Vichea’s killing, as well as the subsequent arrests and convictions of Born Samnang and Sok Sam Oeun, have been closely scrutinized by both international and na­tional human rights and labor groups. Chea Vichea, an outspoken and prominent union leader, was shot dead in broad daylight at a newsstand in Phnom Penh on Jan 22, 2004. 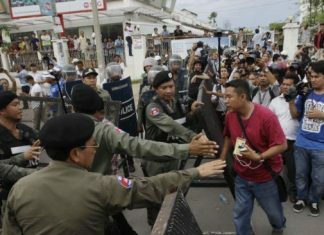 Born Samnang and Sok Sam Oeun were arrested for the assassination a week later amid shock and outrage at what was the first-ever killing of a union official in modern Cambodian history. Without much evidence or a convincing motive, the two men were found guilty of the killing on Aug 1, 2005, a decision that sparked harsh criticism over a deeply flawed police investigation—both men had alibis—and the court apparently coming under influence to ensure they were both found guilty. When the pair first stood trial in 2004, presiding Phnom Penh Municipal Court Judge Heng Thirith dismissed the case against them for lack of evidence. However, four days later Heng Thirith was removed from the Phnom Penh court and on June 1, 2004, the Appeal Court reinstated the murder charges against the pair. On Aug 1, 2005, the men were then found guilty by a different judge, Kong Set, at the municipal court, a decision that was upheld by the Appeal Court on April 12, 2007. Kong Set, who is currently the Kompong Speu Provincial Court Prosecutor, is now embroiled in corruption allegations, which have led Justice Minister Ang Vong Vathana to call for his suspension. During his reading of the court’s order on Wednesday, Dith Munty said that the Appeal Court in March 2007 failed to follow the law when it upheld the municipal court’s guilty verdict against Born Samnang and Sok Sam Oeun. “According to the Appeal Court prosecutor, there were some loopholes and he had requested the Appeal Court to do additional investigation,” Dith Munty said. “But the Appeal Court didn’t consider this and has violated Article 419 of the criminal procedure,” he said. According to Am Sam Ath, senior investigator for local human rights group Licadho, Born Samnang and Sok Sam Oeun were released from PJ prison at 7 pm on Wednesday evening. Dith Munty, who is also a member of the CPP’s powerful standing committee, said that the Supreme Court’s judges decided to release the two men on bail until the Appeal Court rehears the case because the two men have already been imprisoned since January 2004. “Up until now, the charged persons have been detained for more than four years already,” Dith Munty told the courtroom. Sok Sam Oeun and Born Samnang had arrived at the Supreme Court from PJ prison at about 8 am, dressed in blue prison uniforms with white stripes on the neck and front. More than 50 people also gathered in the courtroom for Wednesday’s hearing, including embassy officials from Australia, France, Germany, Sweden and the US. Outside, around 75 people, many of them family and friends of the pair, gathered around speakers that broadcast audio of the court proceedings. There was also a boisterous group of international and local cameramen, reporters and filmmakers. But attorneys from the free legal aid organization, Cambodian Defenders Project, who spoke on behalf of Born Samnang and Sok Sam Oeun, asked the Supreme Court to toss out the original police investigation into their alleged crime. They argued that corrupt police officers-overseen by the disgraced former municipal police chief Heng Pov, now a convicted felon, conducted the inquiry. Hong Kimsuon, who defended Sok Sam Oeun, told the court that his client was framed by Heng Pov, who is currently serving a prison sentence for multiple crimes including murder and robbery: “This was a show to cover up [Chea Vichea’s killing], and [Heng Pov] could not find anyone else,” Hong Kimsuon said. He also argued that the Appeal Court had refused to listen to testimony from defendant witnesses. Chum Sovannaly, the attorney for Born Samnang, told the court that several witnesses proved that his client was not in Phnom Penh on Jan 22, 2004, the day Chea Vichea was slain at pointblank range. Nevertheless, the lower courts had refused to accept those witness testimonies proving his client was not in the city on the day of the killing, Chum Sovannaly said. “If judges believed in prosecution witnesses, they should also believe in these witnesses,” he said. Chum Sovannaly also railed against Heng Pov’s investigation: “Heng Pov’s procedure was against the Constitution, the arrest was without a warrant, they didn’t inform the suspects why the arrest was made, and there was no report about the arrest,” Chum Sovannaly said. During Wednesday’s hearing, Born Samnang testified that he had lied in his guilty confession to the police out of fear. He said Heng Pov’s subordinates set him up for a crime he never committed. “They said: ‘Stay in prison for one year.’ I agreed because I was a bad son who did bad things to my mother and I believed in Heng Pov, that he would ask the King to grant amnesty,” Born Samnang told the court. Born Samnang also said that police tortured him, hitting him in the head in order to coerce a thumb-printed confession stating that he had killed Chea Vichea with Sok Sam Oeun. One of Heng Pov’s law enforcement subordinates also used the carrot along side the stick in dealing with the two men, and Born Samnang told Wednesday how police organized prostitutes, money and food for him in exchange for his fake confession. “They were fake answers and because of these answers, I have been in detention up until now,” Born Samnang said. “They told me to say that I killed Mr Chea Vichea, [and that I] knew Sok Sam Oeun and he was the driver, [and that I] shot three bullets at the distance of three meters,” Born Samnang said. Sok Sam Oeun also denied any involvement in the murder during his testimony Wednesday. “I have never held a gun,” Sok Sam Oeun said. The Supreme Court decision was lauded by many on Wednesday, including the suspects. “Even though, I am not yet acquitted, I can still get bail so I am fine,” Born Samnang shouted to reporters just after the verdict was issued while prison guards shoved the two men hard into a transport van. “I am very happy. I am happy and too excited that I could even speak out that my son could get out of detention,” said Born Samnang’s mother, 48-year old Nuon Kimsry. The Cambodia Office of the UN High Commissioner for Human Rights also endorsed the decision, according to a statement released Wednesday. “The Office hopes that this will be an opportunity to conduct an in-depth and thorough revision of the entire case, both on matter of fact, law and procedure, so that a real decision of justice is made,” the statement said. “We hope this standard can be used as a future example for other cases in order to serve justice,” said Ham Sun Rith, deputy director of monitoring and protection unit of Licadho. “It sounds like a step in the right direction, though we still have yet to see what will come of it. It may be too early to say if this will mean justice,” said Per Nordlund, a representative of the Embassy of Sweden, just after the judicial panel issued the ruling. The US Embassy declined to speak at the courthouse, but later issued a statement. “We hope the appeals court will take up the case expeditiously and finally resolve this matter in a way consistent with Cambodian law and international standards of due process,” the statement said. Meanwhile, Appeal Court Judge Saly Theara, who along with two other judges heard the case last year, declined to comment on the Supreme Court’s strong rebuke of their work. “I don’t have any comments. It is their right to decide. I have no rights to comment. Let the new council [of Appeal Court judges] look at the case,” Saly Theara said. Ministry of Interior spokesman Khieu Sopheak could not be contacted by phone Wednesday and Deputy National Police Chief Sok Phal declined to speak about the original investigation into Chea Vichea’s murder. “We are the same police. How can we comment?” he said. “We can only implement what the Supreme Court decided. I congratulate the Supreme Court’s decision on behalf of the police,” he added.